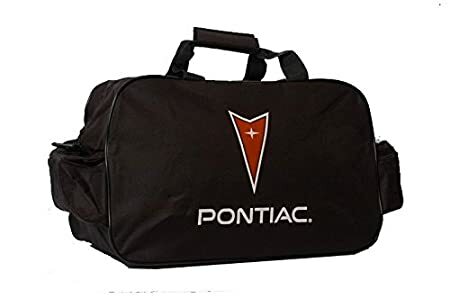 After seeing this thread: http://www.fiero.nl/forum/Forum1/HTML/097564.html and seeing the Pontiac accessory bag that tshark had, I wanted to get one and use it for an emergency tool kit. I picked mine up off ebay and it came with several items. All I plan to keep for this project is the bag and the poncho. 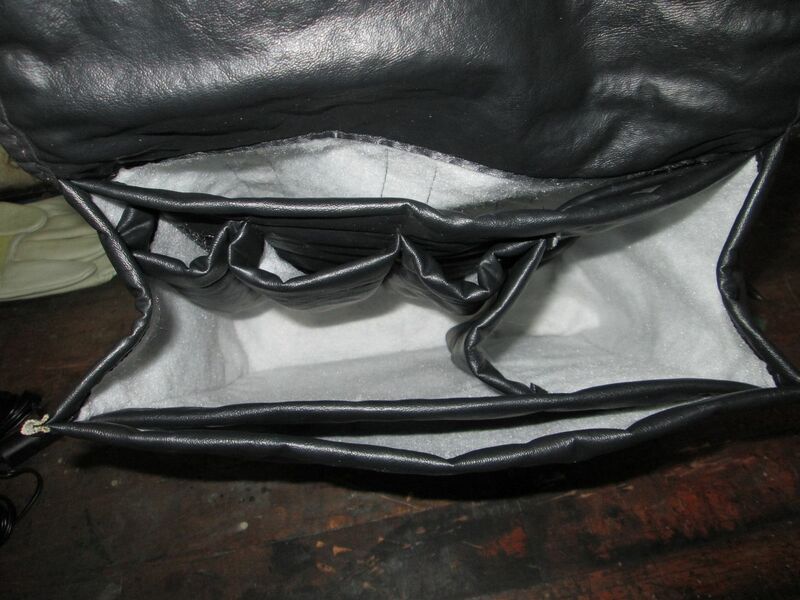 The bag is 10" wide, 4" deep and 11-12" tall and has several pockets and dividers inside. While I have some initial thoughts about some items, I am looking for other suggestions for small, compact and highly versatile tools. 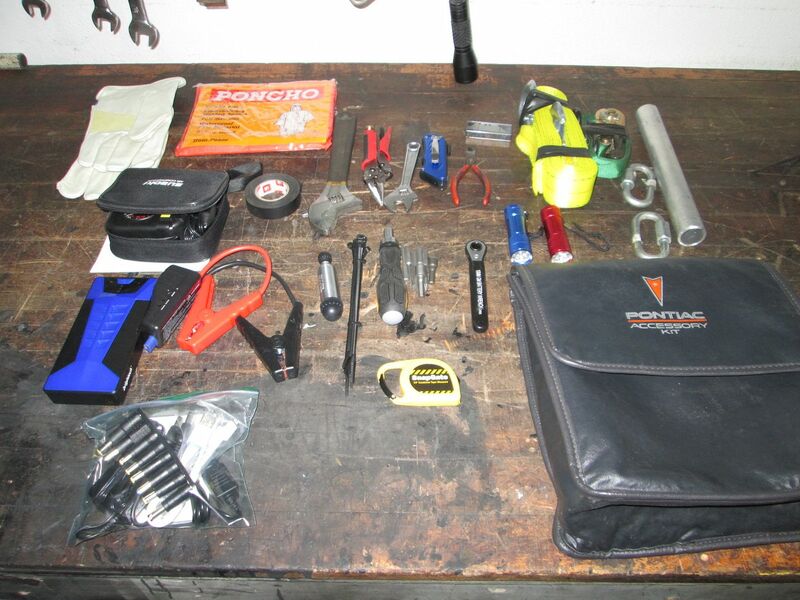 The goal is to maximize the potential use of this bag of tools while keeping everything within the confines of the bag. My primary concern is to have the tools needed to get me past common issues and back driving. So I don't really care about spare bulbs (I can always stop at a parts store along the way). This is for my LS4/F40 Fiero, so I don't need the common Fiero engine parts like an ignition module. I am more concerned with flat tires, dead battery, or other minor spur of the moment repairs. 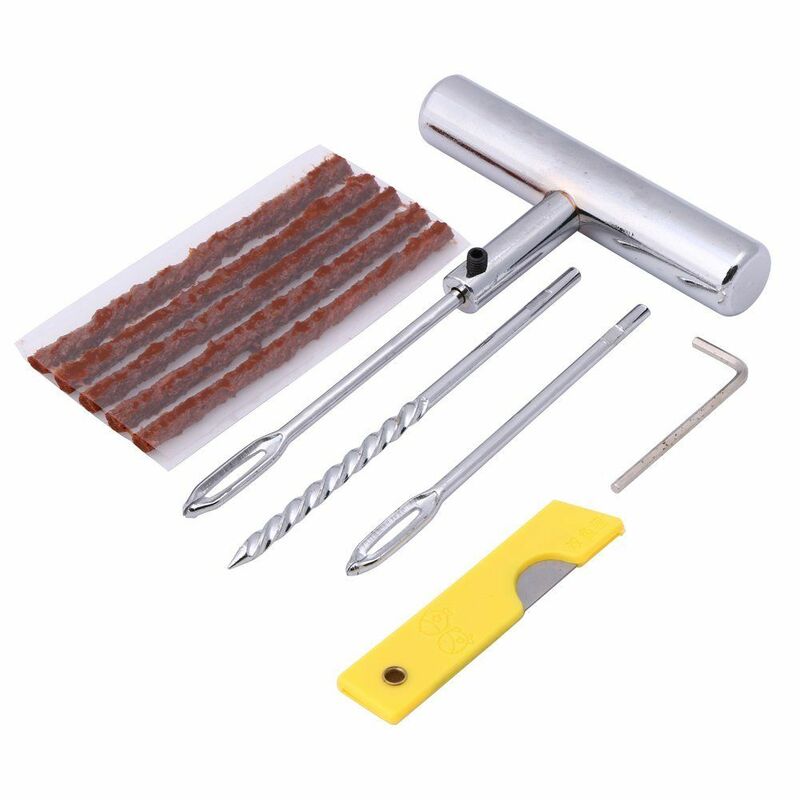 While I have some initial thoughts about some items (see pic below), I am looking for other suggestions for small, compact and highly versatile tools. So review what I have (or am thinking about) and share some ideas and post links to some useful and compact tool suggestions. Small/bright LED flashlight - balance between size and lumens. Fuses - some kind of small box with an assortment of fuse sizes. Ratchet strap - the one I have shown is a little too big. I will likely find a smaller one. Cresent wrench of some kind - any cool ideas? So what other cool tools should go in this bag? 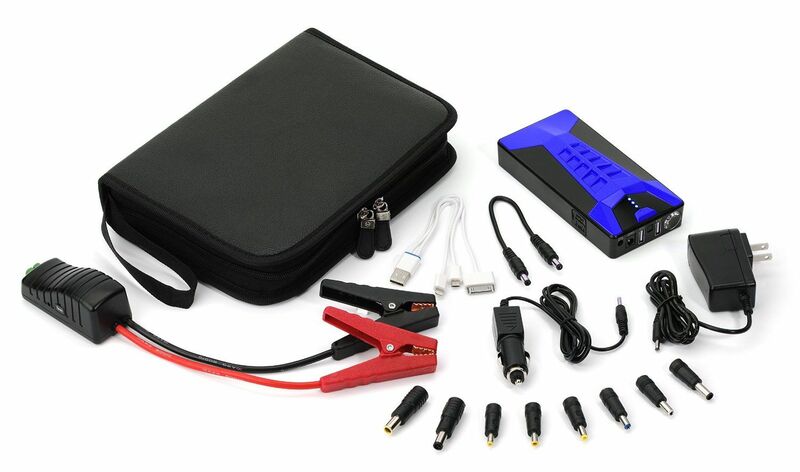 Perhaps the cellphone sized battery jumper would be a good alternative to jumper cables of any size. You may even find one with an LED flashlight incorporated. I too am considering putting a kit like this together, and the aforementioned thread is also what inspired the idea. A magnetic pickup tool or grabber would be smart to add, preferably a telescopic one. Bahhh way to much thinking here. You only need two things.... something to charge your cell phone, just in case it is dead when the car dies. The other thing you need is a credit card. Car quits... charge the phone and use the credit card to get a tow.. Maybe a flare gun just in case you are out of cell service when it dies... All kidding aside.. When I take the Fieros on long drives I do not take much of anything. The stock GT has an ICM and Philips in it some where I think... at least it did a few years ago. Cell and a credit card and the better half if I can convince her to go with me that's all I take. serpentine belt, extra fluids (brake, oil). The hand crank flashlight is a good idea, but you need one where a single crank provides at least a minute of illumination, and that will take several cranks. I have that multi-tool and several others. Not so great. My battery tool is coated everywhere except the business area, to prevent shorts. I have gorilla tape, rather than duct tape. I have the thin box cutters (basically a flat rectangle with a sliding blade). I have actual drivers (not tips) for torx, slotted, and phillips. Don't cheap out on these tools. Get quality, with at least a 4' shaft. 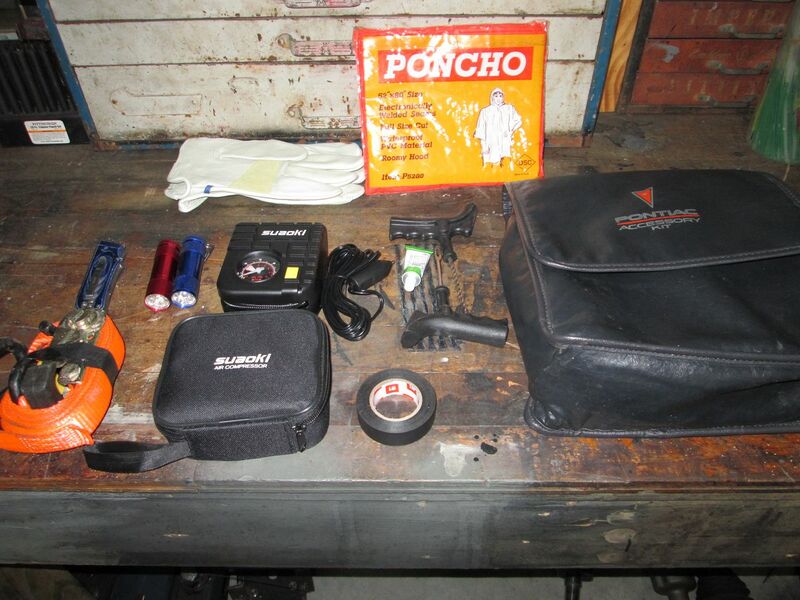 TFS sold a tool bag. These tools go in that bag. Aside from gloves, a shop towel works great. Not those cheap red ones, though. The red ones shed and stain everything. I use the blue disposable ones. I replenish from a roll at home. Electrical tape gets hot, gooey, and melts everywhere. I got something similar that is more heat resistant. For the tire repair kit, I used one from an ATV. Very compact. It has compressed tubes. I haven't tried the emergency fuel pack. No tow or racheting straps. In case a tow is needed, the tow vehicle will have these. Without a tow vehicle, not much good. I don't strap anything to my Fiero. These are useful on ATV tires, when mounting a flat, because ATV tires mount at 15PSI or less. Not car tires. I use the fuses that light up on failure. Not sure how that works. I would avoid fluids or batteries in your bag. I still carry an ICM, the coil to ICM cable, a PCV, a MAP sensor, etc. It may help someone else. I have a spare oil cap, and a spare radiator cap. I carry a bag of spare screws. Oh, and a chamois cloth. 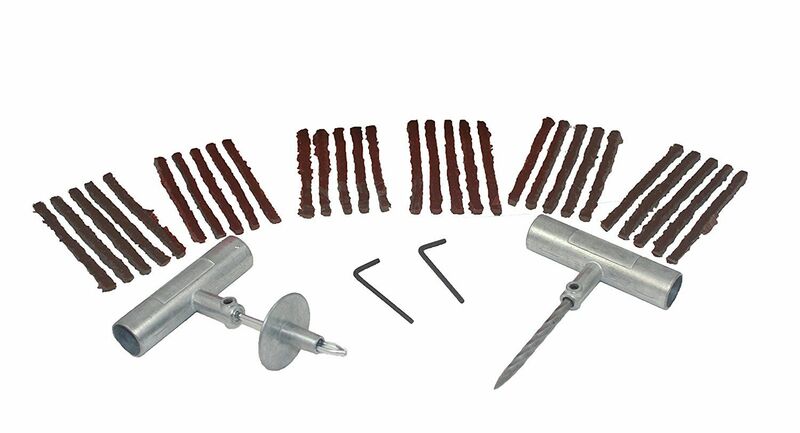 I have been researching tire plug kits. I am more concerned with overall packaging bulk, as I really don't want 2 t-handles in the bag. This one has removable ends so only 1 t-handle is needed, but I would like it better if the t-handle was drilled to hold all the other pieces while in storage. I like this one a little better as the ends are still removable, but the handle is hollow so I could use it to store the parts and put some caps on the end. This one is also very interesting. In the bag it would just be the round tube with all parts stuck inside. I can also get a couple more attachments for it, but not sure they would fit inside the main tube. I've got one of those bags too. I've since relocated it to the trunk. I really should get organized and keep more important stuff in it besides random junk like I have now. For stock Fieros, ignition coil, control module, and tools required to change. Don't forget the heatsink compound for the control module! 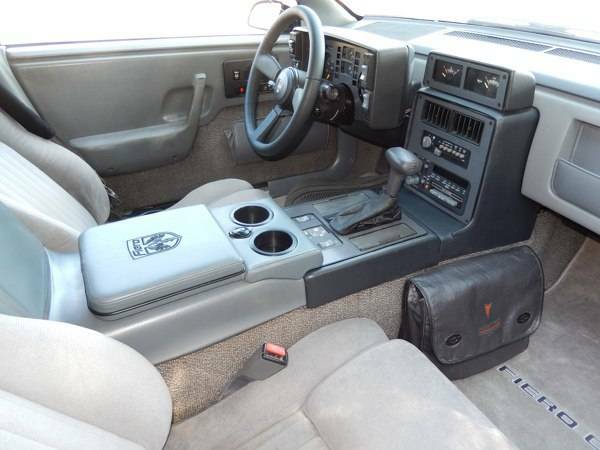 I also always carry a jump box in my daily driver, as a direct result of when I used to daily the Fiero. Mine has a built-in air compressor, so two in one device. Used it this past winter to help a little old lady start her car in the snow. Been doing some more research and I think the jumper cables are out and a small jump box will be used. I think I am sold on the Brightech Scorpion - dimensions of 6.1 x 3 x 1.2 with 400A starting and 10000 mAh. 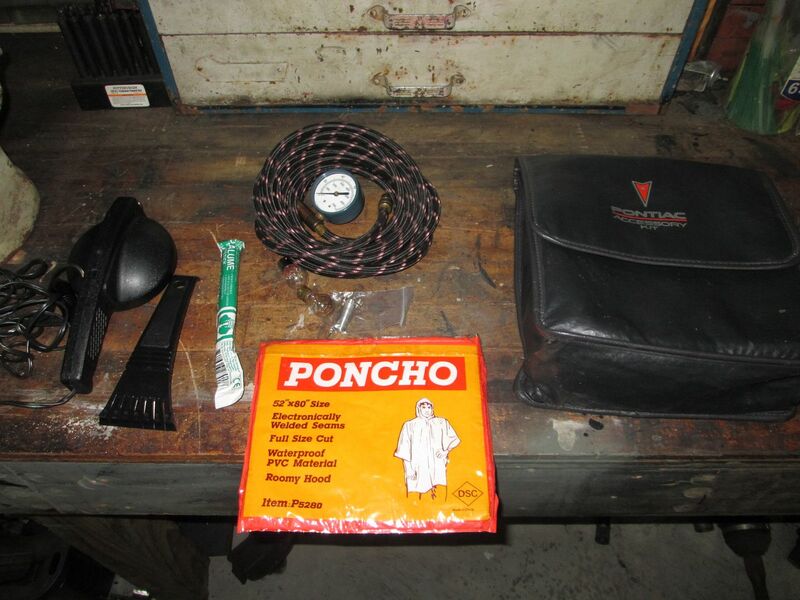 I've been thinking of making a roadside kit for my car for a while now. I just ordered a bag like the one you got of ebay after seeing this. Not only is that bag perfect, but it comes with a hose for the air compressor in my van which I needed anyway. On the topic of jumper cables/boxes, I have a very nice set of cables, but jump boxes are the future. My coworker and I both have this one and love it. 1000amps, and lots of safety features like short and reverse protection. My friend has one that's a little boxier, and he designed and 3D printed a charging dock for it that fits in the glove compartment of his car so it's always ready to go. The NOCO Genius Boost+ GB40 like the one you have was my initial choice, but it is 6.7" x 3.2" x 1.7" and while the Brightech Scorpion is slightly less powerful, it is 6.1" x 3" x 1.2" and gives me more room in the bag for more tools. I really liked the Brightech Spider also because it was even smaller at 5" x 3" x 1", but I think it has been discontinued as not even the Brightech store has it in stock. 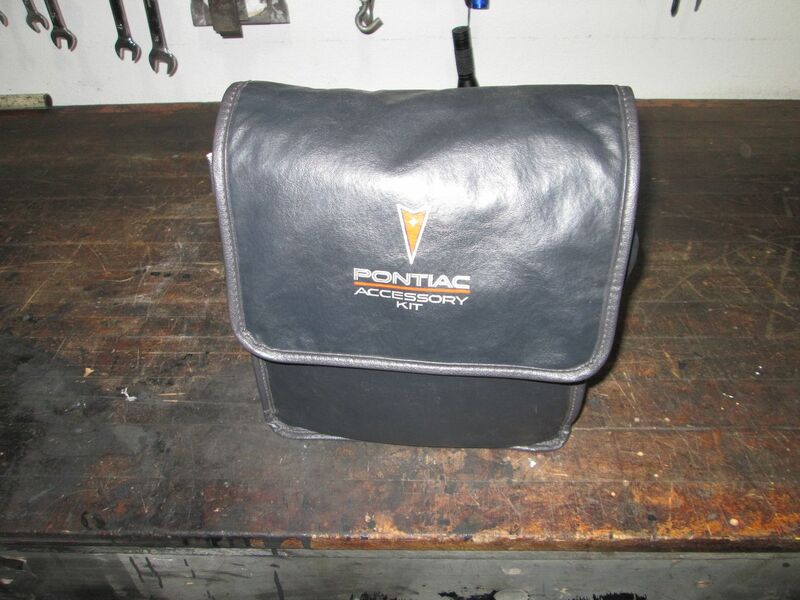 A Pontiac bag (eBay) like this would work as a tool bag as well. I have one for my detailing supplies when attending car shows. One of those combination tool kits with a handle and lots of driver bits in it, usually has a couple of jewlers screwdrivers and maybe some sockets as well. For the led lamp, get one of those on a headband. Keeps you hands free. Nitrile/latex gloves to keep hands clean. Dropcloth like painters etc use to protect stuff when painting to put on floor if you need to crawl around. Pre packed rolls are very small and cover a good area. I ordered the Scorpion jump start kit and the tire plug kit. Most of the other tools arrived earlier this week, so hopefully by next weekend I can start playing tool tetris and see how much stuff I can fit in the bag. Gloves, poncho, air compressor, electrical tape, 2 crescent wrenches, needle nose pliers (I ground down the end to make it more pointy), blade knife, diagonal cutters, 20' toe strap, ratchet strap, 2 chain couplers, cheater bar, battery jump box (and other adapter to charge other items in clear plastic baggy), tire plug kit, several wire ties, screwdriver with multiple inserts (2 flat, 2 phillips, 7mm, 10mm, and interior torx), tape measure, 10mm battery terminal wrench, and 2 LED flashlights. I am still looking for a small container to hold a few fuses. I also would like a better screwdriver with a hollow handle that can store all the bits. Everything does fit into the bag! the Dynaplug kit you showed above works, I used to carry one on my motorcycle, way easier than the old school style plugs. downside, for a large hole, it may take 2 or 3 plugs to patch a tire.